The work Iguaçú means "big water" in the tupi-guarani etymology. The Iguaçú river, which forms the Falls eighteen km before the river meets the Paraná river, overcomes a ground unevenness and plunges 65m with a width of 2,780m. Its geological formation dates back to approximately 150 million years. The Iguaçú River is 1,200 wide upstream from the Falls and downstream it narrows down to a 65m channel. The total width of the Fall in the Brazilian territory is around 800m and 1,900m on the Argentinean side. Depending on the river flow, the number of waterfalls ranges from 150 to 300 and the height of said waterfalls ranges from 40 to 82m, accounting for a 2,700m semicircular shape. The average water flow of the river is around 1,500m3, ranging from 500m3/s during the draught season to 6,500m3/s during the flood season. The individual waterfalls may range from 20 to 300 depending on the water volume. The large waterfalls are 19, three of them on the Brazilian side (Floriano, Deodoro and Benjamin Constant) while the remaining ones are on the Argentinean side. The position of the waterfalls, most of them on the Argentinean side and facing Brazil, provide a better view to those admiring the scenery from the Brazilian side. After taking a wide turn and the rapids, the bulk of the falls plunges laterally into the deep erosion gorge, the Devil's Gorge. This 85m high waterfall is the one most appreciated by tourists; its shape resembles a horseshoe. The Devil's Throat is the site of the biggest waterfall and the greatest sight Iguazu Falls has to offer. You can see a great amount of water gushing over 230 feet from above the waterfall or from many different angles in the surrounding area. There are even helicopter tours that let you see the amazing spectacle from above for a fairly reasonable rate. The Circuito Superior (Upper Circuit) is a half-mile loop along a protected catwalk that is surrounded by spectacular views of the "Devil's Throat" and the magnificent waterfalls of Iguazu. Visitors approach the falls at a close (but not too close) distance, for an unparalleled experience of a natural wonder. 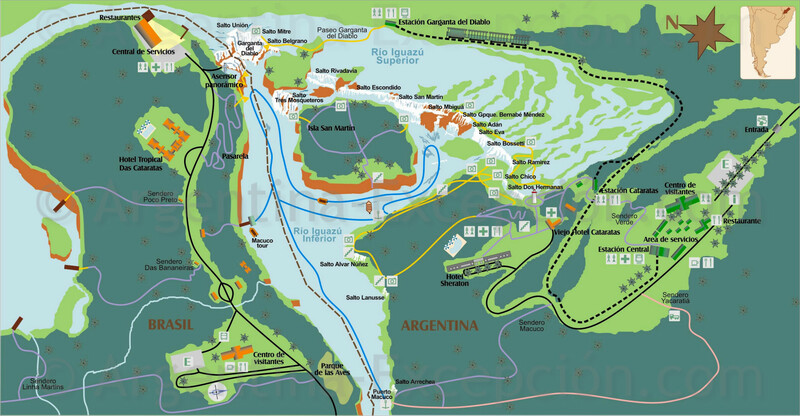 The Circuito Inferior (Lower Circuit) provides a longer trail (3,000 feet) to view the Dos Hermanos, Bossetti, Ramirez, Chico and finally San Martin waterfalls, as they all plummet into the Rio Iguazu (Iguazu River) below. Gaze upon an endless stretch of falling water and its white foam as it explodes into the river. Other Information Although Iguazu is best known for their waterfalls, the surrounding jungle is well worth including in your explorations. A plethora of animals and birds make their home in the lush vegetation around the Iguazu National Park. There are also a number of other highlights in this region such as The San Ignacio Jesuit Mission Ruins, The Itaipu Dam, and the Yacutinga Lodge Wild Preservatory. 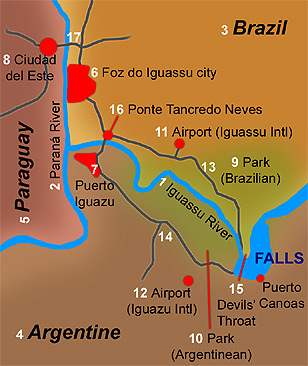 The map of the Iguassu Water Falls region, exposes the big geographical references and location. Hotels are mainly located in the cities or near the road that links the (13) Falls and the Foz do Iguacu (Brazil) or the road that links the (14) Falls and Puerto Iguazu. The Devil’s Throat (15) is at the heart at the Falls. The access to Argentine (or to Brazil, if you are in the Argentinean side) is made by crossing the bridge Tancredo Neves (16). When is the best time to visit the Brazil / Argentina Iguassu Falls?